Ven. Jeongun, the Head of the Institute of Buddhist Studies and Ven. Seohyeon, Secretary General of Department of Education at the Jogye Order of Buddhism held a press conference on April 8 explaining to reporters about Seon Quotes. 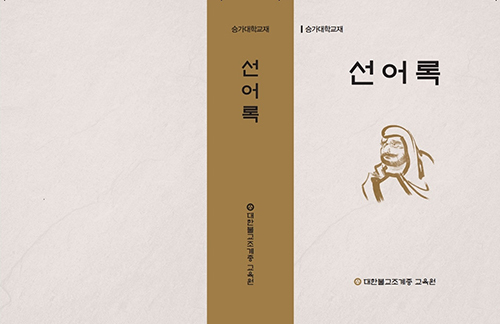 The Jogye Order of Korean Buddhism published a collection of the quotes made by the Seon practitioners of Korea and China who left great footprints on the history of Seon Buddhism. Compiled into a single volume, Seon Quotes will be used as a textbook for preliminary training for monastics. This book will help those who study and practice Korean Buddhism to better understand uniquely Seon aspects of Korean Buddhism in particular and the history of Seon in general. Department of Education of the Jogye Order (Director: Ven. Hyeoneung) held a press conference on April 8 in the conference room on the 2nd floor of the Jogye Order Headquarter building and unveiled Seon Quotes, containing the essential quotes made by the great patriarchs of Seon Buddhism translated into Korean. The new book’s primary focus is to educate newly initiated monastics on Seon traditions. The Jingde chuandeng lu (the Record of the Transmission of the Lamp) is one of the foundational sutras of the Jogye Order of Korean Buddhism along with the Diamond Sutra. As such, the quotes made by the bygone masters are being taught as part of mandatory courses in the official curriculum for the basic training for monastics devised by the Education Department. According to the revised edition of the Seon Buddhism training manual for the professors of sangha colleges and Buddhist universities published by the Education Department, the newly initiated monastics should take 15 classes in the 1st semester, and 16 in the 2nd on Seon Buddhism, using the textbooks and references listed in the manual. However, the classes on Seon Quotes, though mandatory, were taught differently by different schools using different textbooks. Most classes on Seon Quotes used texts written in Chinese characters and did nothing more than just translating the quotes written in Chinese into Korean, and there has been a strong demand that a standardized textbook must be available. As such, the Education Department compiled a single volume Seon Quotes from already existing books of similar nature published by various institutions such as Bulguong Publishing, Dongkuk Sutra Translation Institute, Unju-sa Temple in-house publishing group, Fragrance of Silence, Dharma Offering, CIR and Basic Training Institute in-house publishing group. Seon Quotes I, designated as a mandatory course will include the lectures on: the Zuochan sanmei jing (Sutra on the Samadhi of Sitting Meditation) by Kumārajīva, the Compiled Words of Bodhidharma, the Xinxin ming (Engravings of Faith) by Sengcan, the Liuzu tanjing (Platform Sutra of the Six Patriarch) by Huineng, the Chuanxin fayao (Dharma Essentials for Mental Transmission) by Huangbo Xiyun, the Wanlinglu (Records of Wanling), the Words of Shenhui by Heze Shenhui, the Dunwu rudao yaomenlun (Entering the Path by Sudden Enlightenment) by Dazhu Huihai, the Chanyuan zhuquan jidu (Origins of the Various Chan Teachings) by Guifeng Zongmi, the Chanyao (Gist of Chan) by Gaofeng Yuanmio, the Mengshan fayu (Compiled Dharma Talks of Mengshan) by Mengshan Deyi, the Chanmen duanlianshui by Huishen Jiexian, the Wumen guan (Gateless Barrier) by Wumen Huikai, the Seonga guigam (Starling Examples of Seon) by Seosan Hyujeong, the Zuochanyi (Instructions for Sitting Meditation) by Cijiao Zongze, and the Rentian baojian (Treasure Collection of the People and the Heaven) by Tanxiu. Seon Quotes II, designated as an elective course, will include the lectures on: the Jueguan lun (Treatise on the Transcendence of Cognition) by Farong Niutou, the Lengjia shizi ji (Records of Teachers and Disciples of the Lankavatara) by Jingjue, the Mazu lu (Records of Mazu) by Mazu Daoyi, the Baizang lu (Records of Baizhang) by Baizahng Huihai, the Guiyang lu (the Records of Guiyang) by Yangshan Huiji, the Linji lu (Records of Linji) by Linji Yixuan, the Caodong lu (Records of Caodong) by Caoshan Benji and Dongshan Liangjie, the Yunmen lu (Records of Yunmen) by Yunmen Wenyan, the Yuanwu shenyao (Profound Essential Teachings of Yuanwu) by Yuanwu Keqin, the Jingde chuandeng lu (Record of the Transmission of the Lamp Published in the Jingde Era) by Daoyuan, the Letters by Dahui by Dahui Zonggao, the Susim gyeol (Secrets on Cultivating the Mind) by Bojo Jinul, the Taego rok (Records of Taego) by Taego Bou and Naong eorok (the Compiled Words of Naong) by Naong Hyegeun. Seon Quotes is referenced, citing key Seon Buddhist materials. Included in the book is also the Seon lineage map to help the young monastics to better acquainted with Seon history. Seon Quotes has been distributed countrywide to all Sangha colleges for preliminary training and used as the textbook starting this year.